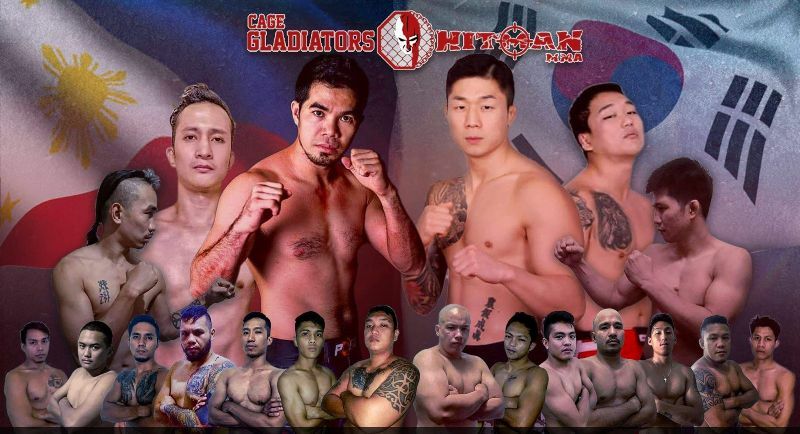 National pride will be on the line as Laurence Canavan’s Cage Gladiators and Burn Soriano’s Hitman MMA announce the official line-up for their next event, Fight Night III: Philippines versus Korea. The grander and more exciting third fight card of the joint promotion shall be held on Sunday, April 14 at the Skydome, SM North EDSA and will pit two Filipinos against Korean counterparts in the main events. MUMMA Fight Club’s Jeffrey “Hitman” Biron headlines the main event, going up against Extreme Combat’s Kim Jae Woong in a three-round featherweight contest. In the co-main event, Sprawl MMA’s Miguel Alo battles Extreme Combat’s Min Hyeok Lee in the lightweight division. “I am looking forward to the third edition of our fight night series, which will be the biggest so far in its existence. I am proud that local MMA is reaching new heights with the Philippines vs. Korea fight card this time,” said Soriano. “This will be a treat for fans as we all continue to raise the bar in promoting fighters and giving them the necessary platforms to be successful in local MMA,” said Canavan. Fight Night III is Cage Gladiators/Hitman MMA’s third major event, succeeding Friday Fight 2 which took place last February 1 at the Pop Up in Katipunan. Canavan and Soriano are both looking to stage more events for the rest of the calendar year.